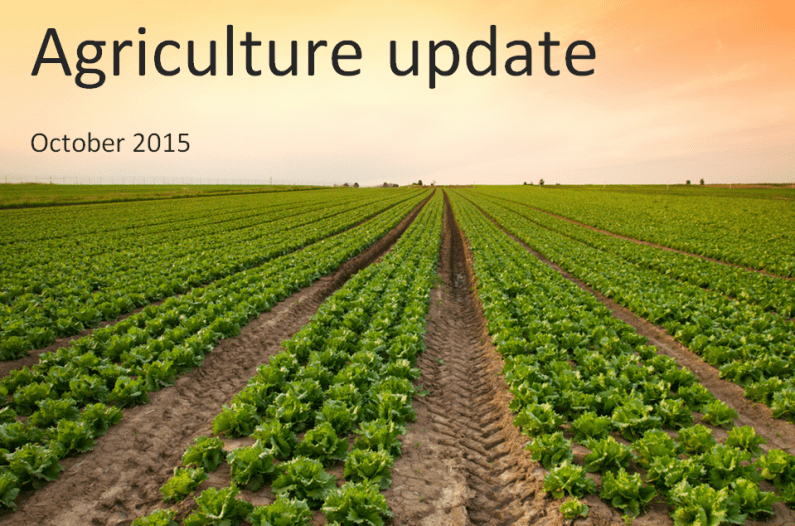 Welcome to our second agriculture update for UK farmers, a new monthly edition on the Hawsons website. From the 1 October 2015, the UK National Minimum Wage increased. Could Defra be disbanded in new government cuts? There are rumours abound that Defra could be disbanded in the latest round of government cuts, with confirmation set to be announced in late November. Prior to the General Election there were similar rumours surrounding the future of Defra; however, this time, the rumours are said to be more serious as the government plans more severe spending cuts. Although the future of Defra and farming policy is still unclear, initial thoughts are that a disbanded Defra could see farming policy made the responsibility of the Department for Business. We wait further news and confirmation on this. Is there a very real crisis concern in UK farming? Fertiliser prices are falling as fuel prices reduce. Farm input costs were 2.86% lower in the year to September according to the buyer group. The RPA have said that the “vast majority” of 2015 direct payments will be received by 31 January 2016. Machinery sales have fallen significantly between 2013 and 2015. Agco have fallen 30.8% CNH 44.8% and Deere 33.0%. Manufacturers have reduced production levels accordingly. Defra’s June 2015 census figures show that the UK’s area of uncropped arable land rose by more than 20% this year. Greening is thought to account for most of this increase. Wheat prices have rallied following delays in drilling in the Black Sea region. Feed wheat price rose £5.30 per tonne and milling wheat increased by £5.90 per tonne. The 2015 UK wheat crop may be 16.1 million tonnes, which would make it the second largest crop for 5 years (there is also 3 million tonnes from last year too). UK arable farmers must therefore ensure that wheat pricing is competitive. CLA has scrapped the loss-making Game Fair which was due to be held at Ragely Hall from 29 July 2016. The Rural Development Programme “LEADER” funding programme has £138m available to assist in creating jobs and helping diversification projects for rural communities across the UK. There are 80 local action groups to which applications can be made and details are on the Defra website. Pig prices have fallen to a 7 year low. The EU spec standard pig price dropped to 127.84p/kg last week, the lowest since June 2008. The UK grain market has come under pressure this week as the strengthening pound has reduced the competitiveness of UK exports.